These statistics have been collated from a variety of different sources, which have differing ways of categorising and describing ‘race’ and ethnicity. (For example, some sources differentiate between particular black ‘groups’ whilst others do not. Some sources may just use the term Asian, others may differentiate between different Asian groups or different religious groups.) Where we have used other organisations’ statistics, we have followed the categorisation/names used by them – which means that there may be inconsistencies in terminology within and between pages. Throughout the UK, people from BAME groups are much more likely to be in poverty (ie an income of less than 60 per cent of the median household income) than white British people. In 2015, Pakistani and Bangladeshi communities were the most likely to be in ‘persistent poverty’, followed by Black African and Black Caribbean communities. 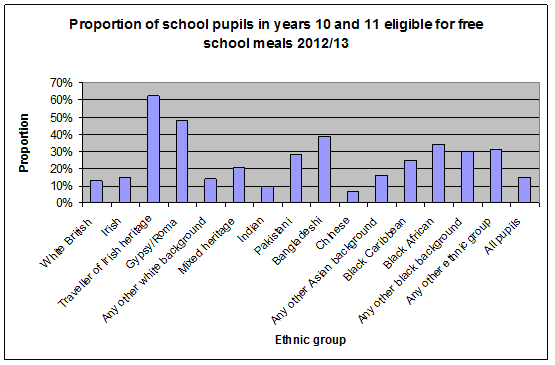 One measure of poverty relates to the eligibility of free school meals. In 2012/13, the ethnic groups most likely to be eligible were the Bangladeshi group (38.5 per cent), the Gypsy/Roma group (47.8 per cent) and the Traveller of Irish Heritage group (62 per cent). In 2010, nearly three-quarters of 7-year-old Pakistani and Bangladeshi children and just over half of those black children of the same age were living in poverty. About one in four white 7-year-olds were classed as living in poverty. Prior to 2008, ‘White majority’ households had an average weekly income of £508 per week. The Indian group had an average income of £467 per week; Black Caribbean £376; Black African £335; Pakistani £266 and Bangladeshis £245. Between 2009 and 2013, Indian, Black African and ‘Other White’ groups’ incomes decreased by an average of 10 per cent. The Black Caribbean, White majority and Bangladeshi groups saw falls of 3–4 per cent. In 2009, the Wealth and Assets Survey revealed that the ‘average white household’ had roughly £221,000 in assets, black Caribbean households had about £76,000, Bangladeshi households £21,000 and black African households £15,000. In 2013/14, just under 20 per cent of white individuals had ‘relatively low income’ after housing costs (defined as receiving less than 60 per cent of the median average). The Black/African/Caribbean/Black British groups and ‘Other’ ethnic groups had just over 40 per cent with relative low income. The Race Equality Foundation showed in 2013 that overcrowding is most commonly experienced by Black African and Bangladeshi groups (with just over a third of households living in overcrowded accommodation). In 2014 the Runnymede Trust examined overcrowding in three areas of London: Redbridge, Croydon and Kingston. In Redbridge, 13 per cent of BAME groups lived in overcrowded accommodation compared to 4 per cent of White households; Croydon 14 per cent compared to 4 per cent; Kingston 14 per cent compared to 5 per cent. Drawing on 2011 census data, the Race Equality Foundation shows that Bangladeshi households are 63 per cent and Black African households 75 per cent more likely than white British households to suffer ‘housing deprivation’ (indicators of which include overcrowding and an absence of central heating). White Gypsy and Irish Traveller households are seven and-a-half times more likely to experience deprivation in this way. In 2011, more than 50 per cent of the people in the Indian, White British, Pakistani, White Irish and Chinese groups lived in a home owned outright or with a mortgage. Home ownership was lowest among Black African and Arab groups (24 and 27 per cent respectively). Home ownership amongst all ethnic groups decreased between 1991 and 2011. BAME groups are also more likely to experience homelessness. In Wolverhampton, for example, in 2011, 26 per cent of the population were from a BAME community, but these same communities made up about 40 per cent of the homeless cases seen by the local authority. In 2014 the Runnymede Trust found that in the East London borough of Redbridge, black people made up 26 per cent of homeless persons, whilst making up 9 per cent of the population. White people made up 24 per cent of the homelessness population whilst 63.5 per cent of Redbridge’s total population. According to BMENational and the Human City Institute, 28 per cent of statutory homeless households were from a ‘BME background’ in 2001; by 2011 this had increased to 33 per cent and by 2013 this had increased to 37 per cent. Homelessness is further disproportionally experienced by migrant groups. The Combined Homelessness and Information Network (Chain), in its annual bulletin for 2014/15, said that 57 per cent of those rough-sleeping in London were not from the UK. 36 per cent of those rough-sleeping were from Central and Eastern European (CEE) countries, with Romanians making up 19 per cent of this figure. Five per cent were from African countries, and 4 per cent were of Asian nationality. Minority ethnic groups have historically been more likely to experience unemployment than the white majority. According to the ‘Social Policy in a Cold Climate’ (SPCC) research programme, between 2007/8 and 2012/13, the proportion of those who were of working age and unemployed from BAME communities increased at a faster rate than white majority communities. In London, the unemployment rate for white majority communities increased by 1.8 per cent; by 5.2 per cent for Pakistani communities, 5.1 per cent for ‘mixed-multiple’ ethnic groups, and 3.0 per cent for Black/African/Caribbean communities. As of March 2015, 5 per cent of White people, 13 per cent of Black (African or Caribbean) people and 9 per cent of Asian people, of working age and eligibility (16-64), were unemployed. In March 2015, figures showed that the proportion of 16-24 year olds from BAME communities unemployed for over a year had increased by almost 50 per cent (to 41,000 people) since 2010. For their white counterparts, there had been a decrease of 2 per cent. In March 2015, 15 per cent of white 16-24 year olds were unemployed, compared to 29 per cent of their black counterparts, 24 per cent of their Asian counterparts and 23 per cent of those from ‘other ethnic backgrounds’. In 2011, about one in four black Caribbean and Bangladeshi households did not have a family member in employment. This figure was slightly less for black African and Pakistani households. Of white British households, roughly 15 per cent did not have a family member in employment. Throughout the UK, BAME communities are less likely than white people to be paid the living wage. The Joseph Rowntree Foundation showed in 2015 that the ethnic group least likely to be paid below the minimum wage was white males (15.7 per cent); and that which was most likely was Bangladeshi males (57.2 per cent). 38.7 per cent of Pakistani males were paid below the minimum wage, 37 per cent of Pakistani women, and 36.5 per cent of Bangladeshi women. Between 2011 and 2014, temporary working increased by 25.4 per cent for BME employees and 10.9 per cent, according to the TUC. By Autumn 2014, around one-in-ten BME workers were employed in some form of temporary employment.